One month until Flying Scotsman arrives in Devon. With one month to go until Flying Scotsman arrives in Devon on her maiden journey into Cornwall, Stream Dreams has announced that the iconic steam locomotive – the first to be officially authenticated at reaching 100 miles per hour – will be double-headed with an engine from the same design shed, B1 Mayflower, for the first time since 1976. Steam Dreams is also announcing that, due to unprecedented demand, an additional leg will be added to her Cornwall journey with a trip from Plymouth to Par (return) taking place on Saturday 6 October. 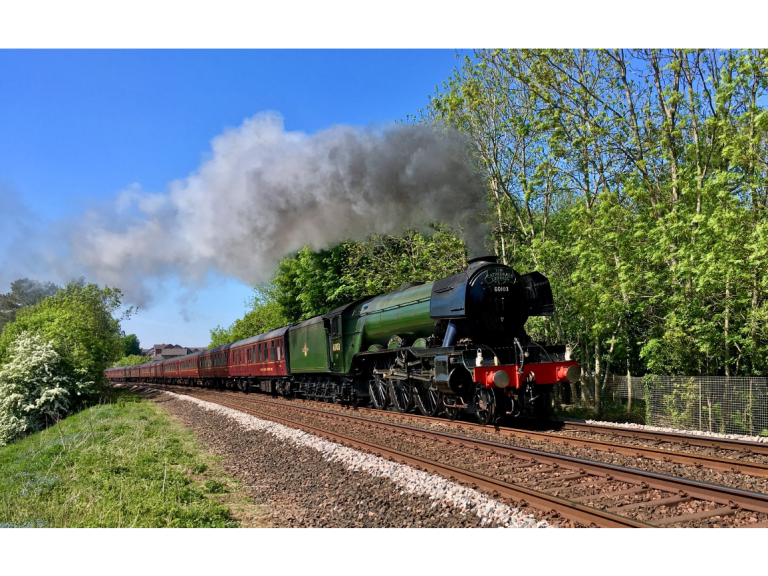 Flying Scotsman will travel in to Devon for the first time since restoration, on 4 October 2018, departing from Taunton to Plymouth at 16.30, taking in the dramatic water-front stretch along the Exe Estuary, past Dawlish Warren, Dawlish, Teignmouth and the shores of the Teign Estuary, before passing through Newton Abbot, skirting the Southern edge of Dartmoor, and heading to Plymouth. Tickets are available for the journey in one of four classes, returning diesel-hauled to Taunton. She then travels from Plymouth to Penzance on a sold-out trip, before returning to Plymouth for the additional trip to Par on Saturday 6 October, leaving Plymouth at approximately 1700hrs. On Monday 8 October Flying Scotsman and Mayflower will journey north from Plymouth to Exeter (departing at 0900), taking in the dramatic estuary and coastline leg, before boarding new passengers at Exeter (1530) on the final phase of the West Country tour, taking passengers from Exeter to Bristol, who return diesel hauled. Jim Lowe, head of operations at the National Railway Museum, said: “In the past two years, Flying Scotsman has been seen by thousands of people as we embarked on a national tour of heritage railways and scenic main line routes across the UK, but the locomotive has not visited Devon or Cornwall since being restored - until now. David Buck, Owner of Steam Dreams added: “Flying Scotsman is synonymous with world records. It was the first steam locomotive to reach 100 mph in 1934 and then set the record for the longest non-stop run by a steam locomotive when it ran 422 miles in 1989. Now we are bringing Flying Scotsman through Devon, in to Cornwall for the first time ever. It is a privilege to be part of this historic occasion and I am delighted Steam Dreams, with the help of Rileys and the National Railway Museum, can make it happen." David added: “Mayflower’s appearance on these tours is no coincidence as plans are already in hand for this magnificent locomotive, which has never been to Plymouth, to be part of the 2020, 400th anniversary celebration of Mayflower setting sail from Plymouth to North America. Anyone interested in travelling with Steam Dreams should call the Booking Office on 01483 209888 or visitwww.SteamDreams.co.uk.